Once extracted from the Stevia plant it is used as a fine white powder. 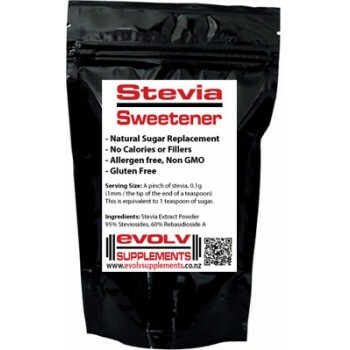 It's up to 300 times sweeter than Sugar so only the tiniest amount of stevia is required. If you are looking for a great way to avoid sugar but enjoy the sweet things then Stevia is perfect for you. Commonly used overseas as as a sugar replacement and increasingly more popular because of the negative effects of sugar in peoples diet. It's also an excellent way to sweeten food for kids to avoid that sugar rush that is so common. Right Side: 2-3 Grams of Stevia on a teaspoon. This is equivalent to 1 teaspoon of sugar.